My name is Stephen Blackhust and I am Deputy Head Teacher of a large comprehensive secondary school in Luton, Bedfordshire. 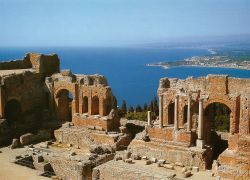 For the third time in 4 years, during the school summer holiday, I am spending 4 weeks studying Italian in Taormina, Sicily. When, in 2005, I decided to put myself in a classroom for 6 hours a day for 4 weeks, having just completed a busy school year, many people thought I was mad. I must confess to having a few doubts myself, people often comment on the length of teachers’ holidays but in truth without them teachers simply could not keep going (neither could the pupils). And my mayor doubt was how I could cope without the long break to prepare far the re-start in September. What actually happened was that that summer holiday, with its total immersion in Italian language and culture was both the most stimulating, challenging and restful break I have had in 28 years as a teacher! When I first embarked on my study of the Italian language, I had only a vague sense of the adventure I was beginning. The main images and conceptions that filled my mind of everything Italian were general and brief, and were associated with the bits and pieces of film, art and programs on the History Channel to which I had tuned, not to mention a few historical books which had caught my interest. None of this, however, spurred my interest enough until I met a group of Italians; finally I heard the language spoken in true form, and observed the culture and manner in which these people lived their life. I was enamoured. 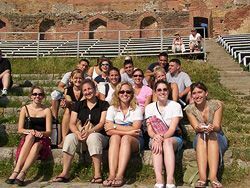 After my initial purchase of an Italian textbook and 6 long months of trudging along on my own (but not without the occasional help of my new-found friends), I began to consider the possibility of a study-abroad experience. As an American college student, I needed foreign language credits for my degree and what better way to apply those electives of Art History, World Civilizations, Sensation and Perception, and Intro to Fashion, than to hop the Atlantic Ocean and take a dip right into the real thing? For two weeks, Taormina, located on a terrace with its spectacular views of the beach below and Mount Etna in the rolling hills in the distance was where I called home. I studied at the Italian language school and lived in a rented apartment located behind the sophisticated and chic main street of Corso Umberto. My accommodation was organised by the school and rented from one of the old typical sicilian nonna’s and the three generations of her family that lived in the apartment above. School life is interesting to say the least – for a 24 year old woman who has finished her university studies a few years ago, going back to school is an experience in itself! School life consisted of 4 hours of learning, including grammar, conversation and fun activities within an intimate friendly environment catered for individual needs. Have you got some time off? Want to spend it learning a new language and having an awesome cultural experience at the same time? If your answer is yes then I highly recommend that you look into booking yourself into an Italian language school in Taormina, Sicily! I attended the school for 2 weeks and if I had to name my only one regret it would be that I didn’t make my stay in Taormina a longer one. Taormina is an old medieval town on the East coast of Sicily in between Messina and Catania. 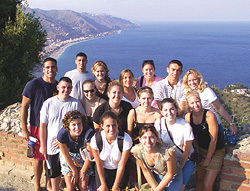 The town itself is situated on Monte Taoro and has spectacular views of the ocean and Mt Etna. Taormina offers a diverse range of activities to suit the likes of everyone, including… boutique shopping in the main street, beaching, possibility of going to the surrounding islands and grottos by boat, there are amazing walking tracks for those who are feeling energetic, and do I have to mention the wonderful Italian cuisine and the gelati!! When you arrive in Taormina for your Italian course, the first thing to do is take the bus from the railway station up Mount Tauro to the centre. 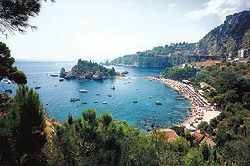 Taking the bus to Taormina is certainly an interesting experience, and for me brought back memories of the Italian Job! The driver was clearly an expert, and negotiated the tight bends at speed. On arrival in Taormina, I dropped my luggage off at the hotel and headed out to explore the town. The first thing that struck me about Taormina was that it mainly consisted of a single street (the Corso Umberto) which is packed with shops, bars and lots of tourists.